Interests - Likes animals, colouring, board games, Lego blocks, painting, crafts, making bead bracelets. He LOVES Minions. Jakub was diagnosed with long segment Hirschprung disease when he was four days old. For five years he was on total parenteral nutrition as he didn’t absorb any food and due to that he was listed for a multi organ transplant. 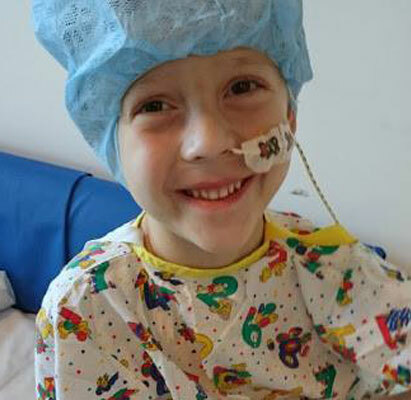 In September 2014 Jakub had his transplant and everything went well. Unfortunately, two days after discharge from hospital, he started rejecting all organs. Since 10th October 2014 he has been at King’s College Hospital. After very strong drugs, Jakub’s rejection was under control and we thought he was getting better, but in January he became unwell again. 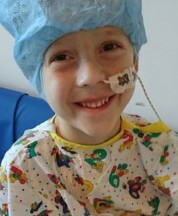 After lots of tests, Jakub had to go to theatre for another surgery as he had an obstructed bowel. The transplant surgeon said to us that Jakub’s bowel didn’t look good and that it looked like one big cocoon. Due to the obstruction some of the bowel had to be removed and it was sent for tests. When the results came back we were told that Jakub has cancer in his new bowel. Jakub started chemotherapy in January 2015 and it has now finished after just four doses. Jakub also spent a long time in intensive care after his last surgery. After all the post transplant complications, we know that it is impossible for these organs to work again, and so Jakub is re-listed for another multi-organ transplant of five organs (small bowel, large bowel, liver, stomach and pancreas). Jakub is now on total parenteral nutrition again and all of his medicines are given intravenously. As Jakub has been in hospital for a very long time, he has lost his mobility. He’s desperate to be able to walk and run around again like he did before transplant. At the moment Jakub remains stable and as well as he could be. It’s still a very long way to go but we don’t lose our hope. We are very sad to say Jakub passed away peacefully last night. Thank you to everyone who has sent him post or fundraised for our Chessington trip. His last weekend out of hospital was spent at Chessington, going on rides, laughing and even eating pasta! We’re still at King’s and Jakub has been on the intensive care unit since Monday afternoon. After all the investigations and tests he’s had done we finally got the results. Now it’s black and white, Jakub was diagnosed with GVHD. A lot of things happened since this diagnosis. It all started with a rash and then he was struggling to keep up his haemoglobin and needed a blood transfusion every day. We stayed all that time on High dependency unit as nothing was getting any better. His skin was getting worse everyday, all of his blood results were bad. Dr’s made the decision to start rutuximab, ganciclovir, many antibiotics, high doses of steroids and also photopheresis. To start photopheresis Jakub needed a new line. So far he only had ECP (photopheresis) for two days. Again everything was awful and the pain was just too much for my little boy to deal with. Every touch was so painful. That’s why at the moment Jakub is on PICU. Unfortunately this week his blood results are not good and he’s so neutropenic and his white cell count is very very low so he couldn’t have photopheresis this weekend. On Monday he’ll be having stem cells. Jakub’s eyes are also affected by GVHD. His skin is still really bad… At the moment there isn’t any chance to extubate him as it’s just too much. Only one positive thing in all of this is that Jakub’s haemoglobin is holding nicely. As always we would like to thank you everyone who is helping us. Every message, every prayer, positive thoughts means a lot and helps us to get through it. We would love to thank everyone who sends Jakub post, cards, letters, parcels and everyone who remembers about him in their prayers. He really needs it now. Jakub has again spent most of the year in hospital. Earlier in the year Jakub had some good times and was able to be at home, but in early June he had to be readmitted to PICU and placed on a vent due to PCP. While recovering from PCP he developed severe skin problems and light sensitivity which was put down to a drug reaction. He was discharged at the end of August, just in time for the Post Pals Chessington weekend. Jakub had a fantastic weekend but a few days later was back in PICU as his HB fell to only 2. He is now in HDU and his skin is getting worse, it’s completely blistered, very painful and itchy. It has been confirmed he has Graft-vs-host disease, as steroids haven’t worked they tried to start him on photopheresis treatment (a little like dialysis, the machine takes the blood out, treats it with UV and returns it to the body) but his line was too small. Jakub will have surgery for a new line and start the treatment. He will be in hospital (HDU) for a long time again. A big thank you to everyone who has sent Jakub post and made him smile. Jakub was discharged from King’s at the beginning of November. We have mostly been able to stay at home, although we have had lots of hospital visits. Jakub is such a strong little boy and he has been through so much. After his second transplant, he had a few complications as he had a leak in his stomach, but it healed on its own. He had two bouts of rejection and he needed high doses of steroids for it, luckily he responded well to the treatment. He had a Hickman line infection and then the line was broken, which meant he needed surgery to replace it. Jakub had a CT scan with a contrast injection through a cannula, the contrast leaked and it resulted in a very bad injury on his arm. Jakub’s EBV was again very high (this could cause the cancer to return) so the doctors decided to start Rituximab. When we thought we would finally be able to go home, Jakub had a very bad chest infection and ended up with a chest drain. He could not tolerate much milk through his NG tube and was on PN, but once all fluids from his chest drained, he made very good progress with milk. At home he made an even bigger progress with a milk feed and Jakub doesn’t need PN anymore; this is such a big thing for me. Jakub still needs IV fluids, but hopefully soon we can stop them. We had to go over to King’s for infusions, but just for a few hours and then we returned back home. We also had to go over to our local hospital for IV correction of magnesium a few times. Jakub had a cold, but this time round just oral antibiotics helped, and we didn’t have to stay in hospital. All I can say is it’s the best thing ever for Jakub to be at home, as he’s making really big progress with his walking, and we have our boy back. Same cheeky, smiley, and happy Jakub. As always we would like to say a very big thank you to everyone who is supporting us and Jakub, as it means a lot to us. We also want to thank you to everyone who sent Jakub birthday wishes, presents and cards. Unfortunately as usual Jakub spent his birthday in hospital, but let’s hope this Christmas we can stay at home for the first time ever since Jakub was born. Jakub has been doing very well following his transplant. Within a week he was in HDU and then moved to the main ward. The pictures of the organs taken out were shocking and so far these new organs have been doing well. Following a line infection the scopes however have shown mild rejection in his bowel. He is managing to eat small amounts and tolerate 5mls an hour feed, as well as using his walking frame a little. Jakub got his call! He is currently in theatre receiving another 5 organs, he was very happy to get his call and laughed all the way to theatre! We’re still on Rays of Sunshine ward and we’ll stay here for bit longer I think. The doctors mentioned home about a month ago but we didn’t go anywhere, as Jakub started spiking temperatures again. We have also had a few problems with our local hospital. They said that they want us to go there as they want to see Jakub, but we disagree with their plans. This is because we’re too scared to take Jakub there whilst he’s well enough to be discharged home in case he’ll catch something, as unfortunately kids like him are in high risk of catching infections and we really don’t want to be stuck in another hospital. Jakub’s bloods results are still not great but we know that they won’t be good until he’s had another transplant. His chemotherapy is finished and haematology consultant is happy with Jakub’s results. Jakub is so happy as we’re going out every day just to give him a little bit of break from hospital. He started to stand up for a very short time but it’s a huge step for him and he’s desperate to be able to walk again. As we’re going out every day, we have our little routine, and every day we’re going to the hospital post room to check if there are any parcels or letters for Jakub! He absolutely loves it! He has the biggest smile ever if there’s something for him! We would love to say a big thank you to Post Pals and Share A Star as it really makes a huge difference! We’ll never forget about the help and support we get from you and everyone around the whole world who thinks about us. THANK YOU SO MUCH! We meet lovely people in hospital who have been here for a long time, like us. Unfortunately April wasn’t a good month in this hospital, as two beautiful kids who spent a long time in here passed away. It’s so hard to be here for so long and we just hope that we can go home soon. After 40 days on PICU and 37 days on HDU we finally been moved to Rays of Sunshine ward! Jakub is so happy to be back here and so am I! He’s still on a lot of medicines for his blood pressure, antibiotics and painkillers. We’ve been told that he may have influenza and that can be the reason why he’s spiking temperatures every day. Let’s hope it will only get better now and we don’t need to go back to PICU and HDU for the third time during our stay in here. After a long 40 days in the intensive care unit Jakub is extubated and today we are moving to HDU. He’s still very sleepy and has a few issues with his high blood pressure. He still has 4 more doses of chemo to go but it’s lovely to have my little boy back and hear him talking about so many different things when he’s awake!! I’m so happy and pleased!! Jakub is still in intensive care. He’s still on filter for his kidneys, still on a vent. He had a few more tests done – CT scan, bone marrow aspirate, etc. Some of them looked good, some of them not good. He’ll stay as he is for another good couple of days. Last Saturday they had to start chemotherapy as his liver started to play up and his bowel isn’t in good condition. We’re still waiting for more results from histopathology and hopefully next week we’ll have more information. Last x-ray showed that his lung is collapsed so he can’t come off the vent. Once he has finished 6 doses of chemo he’ll need stronger chemotherapy in Great Ormond Street. Jakub has now became resistant to most of the sedation drugs so he wakes up and all he wants to do is pull all his lines and tubes. It’s not good for the nurses but that’s my boy! I know we have a long journey to go but we can do it! A massive thank you for all the cards and parcels from all around the world for Jakub!! I can’t wait to see Jakub’s big smile when he sees them!